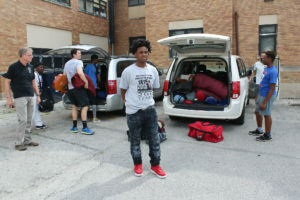 Sleeping bags in the van, extra toothpaste and soap….1, 2, 3, 4 boys……11 boys – Oh, where is Alontae? “We can’t leave without Alontae,” say the 11 waiting at the Precious Blood Center to leave on our adventure. So, we wait for our 12th young “apostle” to arrive. He eventually rounds the corner and off we go to St. Joseph’s College, in Rensselaer IN! If you have ever been to South Side Chicago and Rensselaer IN, you know this will be an interesting story. The boys are excited, and a little fearful of the unknown, but happy to be moving out of the city and away from the violence for a few days. 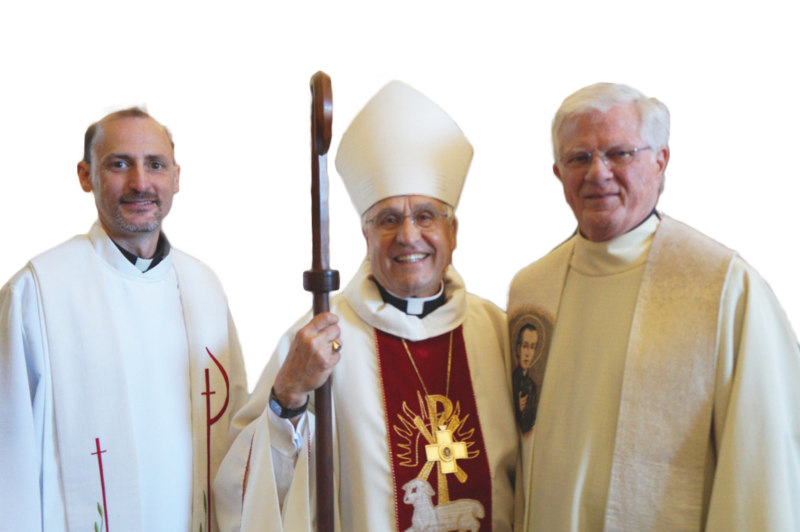 Our adventure began at the invitation of Dr. Bob Pastoor, the president of St. Joseph’s College. For our visit, he gathered campus ministry staff, staff from the art department, and friends of the college to offer our boys the time of their lives! I wish I could just show you a slideshow or video of the whole event—you would be laughing, crying and rejoicing as we all did. Our 12 youth moved into a college dorm for three days and two nights, participating in activities like molding clay, throwing pots at the wheel, tie-dying shirts, playing basketball, and gardening and picking vegetables for the pizzas they eventually made and served for lunch! The kids reported that one of the highlights was being in the quiet of the college woods by Lake Banet with Vince Wirtner, CPPS. Vince invited them into a circle by the lake and then asked them to look around and choose something in the area that they would want to use as their talking piece for the circle. Choose was the key word. Vince cautioned them not to just grab a piece of grass or a leaf, but make a thoughtful choice. The boys took off, walking slowly—looking, smelling, feeling and just listening to the sounds of the lake, the birds, the wind. It was a new experience for our boys, who so often only hear gunshots, screaming, constant highway traffic, and all the sounds of a very busy city. Peace seemed to pervade and they came back to the circle with purpose and with the talking pieces that they had chosen from these quiet natural surroundings. 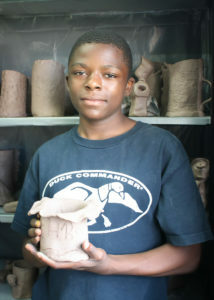 Asa and some of the other boys really enjoyed working with clay at the “potter’s wheel”. 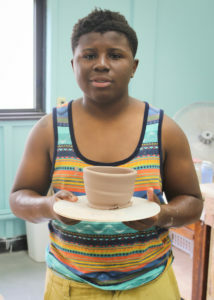 Here they formed and reformed their clay into beautiful vessels with the patient guidance of the St. Joe’s art teacher, Cory and his assistants. 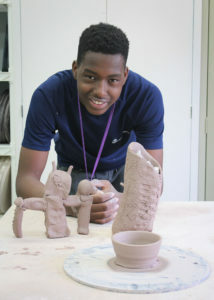 Donell made a vase for his grandmother’s 70th birthday gift; Jariel made a chalice for his aunt who is a minister. It was amazing to see them fully concentrated on the project, molding and delighting in their creations. One evening, three young men, students at St. Joseph’s College, visited us. Two were originally from Jamaica and the other from Ethiopia. With great candor, they told our boys of their experiences at St. Joe College as men of color. Our youth were very inspired. The students advised that our boys should learn their history, read books, and experience life—it was just as, if not more, valuable then school. And, more importantly, they said to never let anyone discourage them from their dreams. On the last day, we went out to St. Joe’s huge garden with gardener Lana and gathered vegetables, fed the goats, learned about aquaponics, hoop houses, and good nutrition. The boys seemed to appreciate and revel in the blessings of the earth. There are many more stories that could be told, and more will definitely be coming, but I hope that you got to experience a little bit of this amazing week. On the last night, as we stood in circle at Dr. Pastoor’s home the boys expressed their deep gratitude, using words like hopeful, inspired, equal, welcomed, wanted, changed and blessed! They are awaiting their next opportunity to reconnect with St. Joseph’s and the generous and hospitable people they met. Of the 12, four have already expressed their desire to one day be a student at St. Joseph’s college! And I know, without a doubt, they will make it happen.